A based letter tribute is based in white Chrysanthemums, and is edged in hand pleated ribbon in a colour co-ordinating waterproof ribbon. 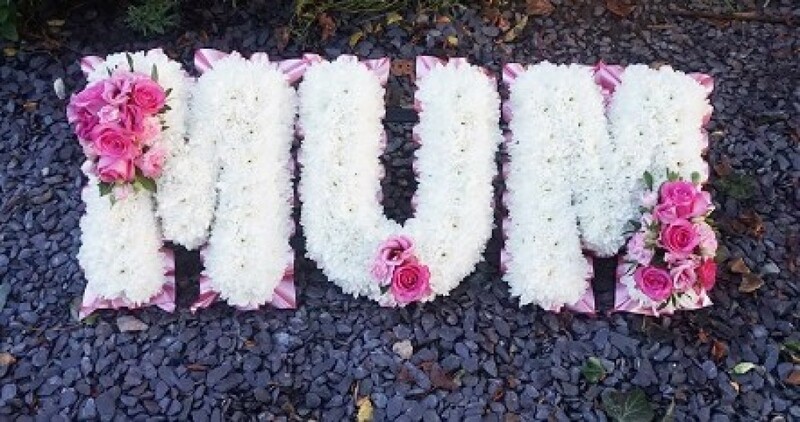 The sprays of flowers on top of the letters are raised above the Chrysanthemums and includes a beautiful selection of Roses, spray Carnations and other flowers to complement the design. Please state which word you would like the words available are Mum, Dad and Nan. 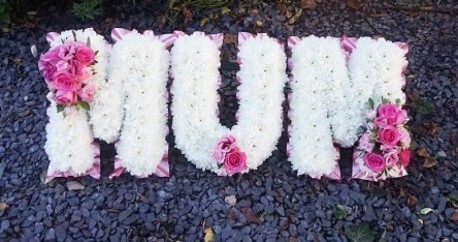 Any word can be made into a letter tribute, please contact us for further details. Also please state the colour you woudl like in the special request box. Suggested colour schemes are red and white, Purple and white, yellow and white, pink and white and peach and white.